Outdoor iron furniture tables and chairs with a conventional iron table, according to the use of the number of custom size; there are iron leisure chairs, a more complete iron table and chair suite will also come with a small coffee table 1-2 sheets, for placing a cup or plant potted plants The Iron table and chair material is generally cast iron or cast steel, molded by high temperature casting mold, and then after the spray, paint and other processes to make iron out of tables and chairs more outdoor use effect, stainless and durable. Iron furniture is relatively thick, strong, the hardness of several times stronger than the solid wood, indoor and outdoor are more like one of the metal furniture. Iron tables and chairs through the high temperature heating iron or steel, melting into molten iron or molten steel, and then poured into the mold cooling stereotypes. Through welding, running and other details of the deal, let the surface smooth and smooth without scratches, touch texture. 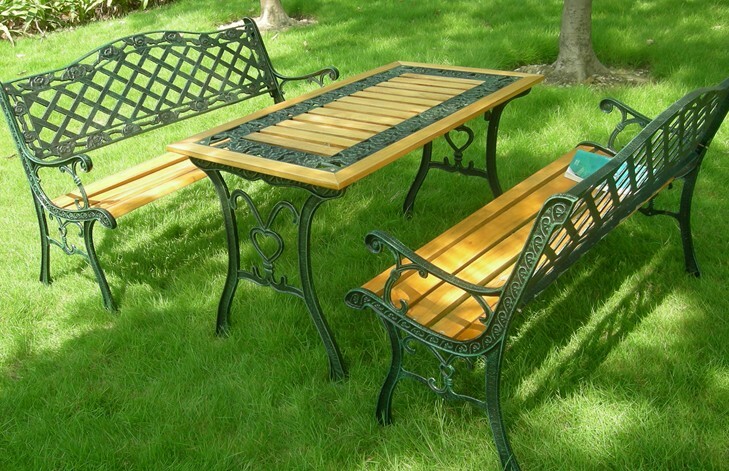 Spray, galvanized after the iron tables and chairs, with water does not rust the characteristics of rust. Because the outdoor iron furniture and chairs are hard and durable, the texture is not rusty, so it is widely used outdoors. Furniture has a drawback, is afraid of scratches. Iron tables and chairs, although relatively strong, but also to pay attention to other hard objects or fell to the ground. So that the surface is not only scratching the impact of beautiful, but also damage the galvanized protective layer, so that iron and steel tables and chairs are vulnerable to moisture erosion and rust. Iron tables and chairs are also relatively heavy people are more distress, because the handling is very inconvenient, especially for ladies. In addition, iron tables and chairs are not resistant to chemical corrosion, in the cleaning side to remember to use soapy water and other cleaning agents containing acid and alkali.